With the return of Earth-2 Harrison Wells and Jesse... Wells? What’s her surname again? Is her name actually Jesse Quick? She should probably think of a new superhero moniker, if so. Although, since she’s from Earth-2 it’s not as if people would actually know her or have any records of her existence. Anyway, with the return of the Wells-Quick duo, a little bit more season plot, and some Barry/Iris romance, this episode was a lot of fun. Meet Frankie! Also goes by the name Magenta, apparently likes the color pink, has a really terrible foster father, and can control metal objects when her eyes turn all glowy. She uses her power over metal to slam a lamppost into her foster father’s face about a minute into her introduction, which I love because for real. Just, a horrible person, her foster father. He deserved that lamppost to the face, times a thousand. One thousand lampposts to the face. The battle against Magenta comes in brief moments throughout the episode as a mystery that the audience knows the answer to but the characters have to figure out. Frankie has to figure it out too, since she has no memory of anything Magenta does and seems genuinely lost when she’s confronted about her lapses into metahumanity. And who does the confronting, finally pushing the truth of Magenta and the Face-Slamming Lampposts into the (ha!) light? Why, it’s our resident Snarky Brit, Julian Albert. His method of dealing with Frankie is to just shout at her until Magenta comes out and throws CCPD’s metal bas relief at his head. Great strategy, there, Julian. Why are there so many idiots on this show? Once in control, Magenta sets out to finish off her gross foster father at the hospital where he’s recovering post-lamppost. Iris is there too, working on the story of the man who got hit with a lamppost, and her Danger Senses are tingling. Because she’s a far better person than most of us, Iris decides that she can’t let Magenta kill her foster dad and tries to get him to safety while Barry and Jesse, who has new speedster powers thanks to that hit by the dark matter last season, try to get Magenta under control. With Magenta/Frankie, the villain this week isn’t so much a villain as she is... uh, misguided, I guess? Traumatized? I don’t really know what to do with her, since her acts of villainy — which she didn’t even have control over — were mainly against her awful foster father. The fact that her powers over magnetism manifested as a dual personality means that she’s neither naturally evil nor a person whose wickedness was brought to the forefront by metahuman abilities. 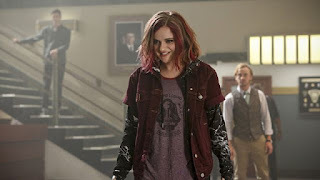 If anything, I suppose that Magenta’s main point was to serve as a plot device for the episode and give Team Flash something to battle other than Barry’s guilt. This kind of single-episode villain simplicity reminded me a lot of the Metahuman of the Week days, complete with a Barry voiceover to start the episode. Ah, nostalgia. Back in those halcyon days when our hero didn’t selfishly annihilate the timeline and negatively affect the lives of everyone he claims to love. Good times. One big difference from that bygone era, however, is the fact that the superpowers gained by our one-off villains aren’t granted to them by the lingering effects of the particle accelerator explosion, but by a masked fella named Alchemy. We learn a bit more about Alchemy in this episode, thanks to Magenta/Frankie recalling dreams she had. The dreams were highly realistic (and painful? She says they were painful, but I’m not really sure if that’s physical pain or she just meant they were hard to deal with) and made her feel like she was living another life, in another world... or another timeline. You know, like the one that resulted from Barry’s ruination. Thanks, Barry! You’re a gem. The Flash touches the edges of a potentially interesting idea surrounding Wally’s desire to get the super speed we all know he should have, and Jesse’s thrilled acceptance of her new speedster abilities. In the past, people who have really wanted powers or reveled in the existence of their metahuman abilities turned out to be evil. The heroes with powers had to learn to accept them over time but didn’t seem too fond of the whole “metahuman” idea. Cisco hid his Vibe abilities from the team when they started manifesting and Caitlin is currently hiding her Killer Frost powers. Up until now, I’ve just assumed that the heroes think metahuman abilities come with megalomania and evilness (except for Barry, and I’m not really sure why everyone simply accepted Barry as an exception). But this isn’t the case for Wally or Jesse. Wally wants his superpowers so badly that he actually steps into traffic just to see if they’ll manifest. Jesse’s more alive and animated than we’ve ever seen her, thanks to her new speedster status, and she even wishes she could share the newfound joy of being able to run really fast with Wally. Even Barry doesn’t seem to like his powers as much as these two like the idea of having powers. I think the interesting part of all this — and it might be connected with Alchemy’s influence on the Flashpoint-metahumans, I’m not really sure — is the fact that metahumans are starting to become the norm on this show. It used to be just Barry and whatever villain he had to face, but now most of the team is superpowered in some way. Wally’s desire for speedster powers might not be something as simple as wanting to run really fast, but could actually be him, you know, wanting to be a part of the team. A “real” part of the team, who can actually help Barry (and now Jesse) in the field, rather than being stuck on the sidelines. The more people who get superpowers, though, the more the “ordinary” members of the team (it’s literally just the Wests now, isn’t it?) seem pretty extraordinary. I mean, how amazing are Iris and Joe for being able to hold their own among superpowers and super-geniuses? And they do hold their own. They’re critical members of the team whose input matters even though they don’t have fifteen degrees or the ability to run really fast. Personally, I really hope that future episodes of The Flash explore the idea of how powers affect power and how people can be heroes with or without meta abilities. “Magenta” hinted at it a little bit — especially with Barry’s speech to Frankie at the end, which revolved around the idea of metahuman powers not really influencing the good or evil or significance of a person. I don’t think the episode went quite as far into the idea as I think the show could go, but I think it laid a foundation for the future that could be pretty interesting. On the lighter and lovelier side of the episode, Barry and Iris spent this week trying to have a successful first date. It’s kind of a failure because Barry and Iris are suddenly awkward around each other, and I kind of suspect that this is another case of a TV show trying to create Romance Drama out of a couple that doesn’t need it. It’s already been established that Barry and Iris are in love with each other, and they’re cute together, and they’re together. Like, in every alternate universe and timeline and Earth, Barry and Iris are together — isn’t them going on a first date a little bit redundant? Whatever. As long as we keep getting scenes with them together and Barry doing dorky things like creating hearts and Iris’s name out of roses (hey, Barry: her name is literally a flower already, why are you using roses? Are irises just too hard to shape into things?) instead of ruining the universe, I’m happy. I will say, however, that this whole Westallen thing feels like some more of that nostalgia that’s been woven throughout this episode. Not just the fact that The Flash remembered Westallen exists, but also the awkwardness kind of reminded me of earlier scenes with Barry and Iris revolving around each other but never quite connecting. I just hope that lack of connection doesn’t last another two seasons, because jeez. Barry’s intro voiceover is getting convoluted. And it’s starting to sound like the side effects lists at the end of drug commercials, in terms of speed. I can’t tell if it’s a Flashpoint effect or if it’s just Harry’s personality coming through after finally getting Jesse back, but he was amusingly kooky in this episode and I love him. "She's calling herself Magenta." "Meh." I love Cisco, too. The Flash is consistently good at tiny bits of dialogue, like Barry muttering to himself about Joe calling him a second daughter. I don’t know if I should thank the writers or the actors for this stuff, but it’s wonderful. "You've gotta use your head,” says Barry, and alas, Earth-1 was consumed by a cloud of irony. Barry basically lecturing Wally like he was his dad was hilarious, though. Wally says “our family” to Barry and I just adore all members of the West family casually including Barry. One big flaw in this week’s episode is Harry’s speech to Barry where he tells him not to blame himself for the Flashpoint thing. Like, I know you wanted to connect your father-fear with Barry’s lapse in judgement, Harry (and The Flash writers) but the consequences of Barry’s actions were 100% his fault and blanket statements about how Barry is too hard on himself aren’t going to cut it for this one. One: I don’t understand how Iris’s hair remains perfect when Barry zips her to their romantic date spot and, two: Barry just leaves her there? What?